Governor Cuomo signed an executive order in 2017 pledging that New York would significantly cut climate pollution. But New York isn’t even close to meeting those climate goals and in his 2018 state budget proposal, Gov. Cuomo didn’t include any plan for getting there. Communities who are most directly impacted by the effects of pollution do have a plan – and it's time for Governor Cuomo to listen. By making big corporations pay a fee for every ton of pollution they create and investing that money in renewable energy, New York can generate hundreds of thousands of jobs every year and actually exceed the pledge Governor Cuomo made to cut climate pollution. 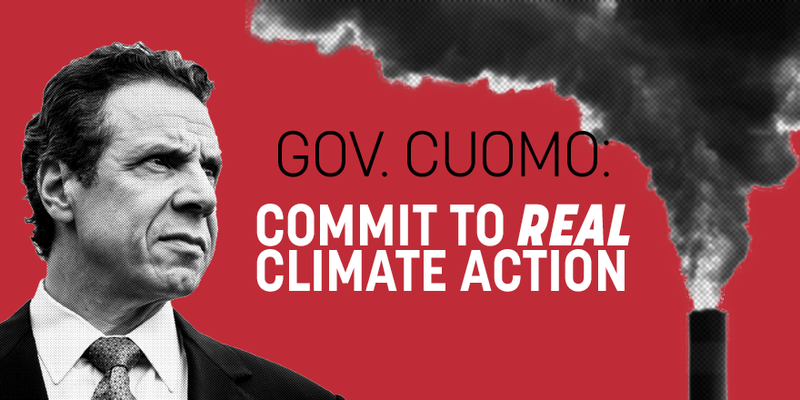 Tell Governor Cuomo to support the Climate and Community Protection Act to create hundreds of thousands of new jobs and move our state to 100% renewable energy, and a fee on the corporate polluters who are responsible for profiting from climate damage. You committed to significantly cut New York's climate pollution and meet the standards set out in the Paris Climate Agreement. But New York isn’t even close to meeting those climate goals and in your 2018 state budget proposal you didn’t include any plan for getting there. It's time for real action, not more empty rhetoric. By 2050, New York can be powered by 100% clean, renewable energy. And we can do it by investing in renewable energy infrastructure, holding corporate polluters accountable for the damage they've done – and creating hundreds of thousands of new jobs in the process. Support the Climate and Community Protection Act and the Climate and Community Investment Act!